Romania will take on reigning Champions Georgia on Saturday in Round one of the 2019 Rugby Europe Championship, also known as the “Six Nations B”. Romanian rugby is in a very difficult spot right now, arguably the worst in history. Everything was good and nice for the Romanians one year ago, as they were qualified for the 2019 World Cup and looking good, claiming wins over sides like Samoa, USA or even Georgia. However, the Oaks were disqualified from the RWC due to fielding an ineligible player in qualifying, and everything turned to disaster – the coaching staff left, a couple of key players retired, then the new coach was fired after just a few weeks. Romania was dreadful in the November tests, losing by 26 points (!!) against USA and also losing to Uruguay – both matches at home. The Romanians will have a new coach for this game, former forwards coach Marius Tincu – who doesn`t really have much experience for the job and was just a cheap, quick hire. Georgia had a solid 2019, although not particularly impressive. The Goergians won the Rugby Europe Championship (beating Romania by 9 points in Georgia) in February, and had mixed results in the rest of the year. Georgia defeated Tonga or the French Barbarians, but also lost 0-28 in Japan and more importantly was dominated by rivals Italy in a 17-28 loss in Florence. That was a disappointing result, as Georgia was trying to make its claim to be in the Six Nations alongside (or instead of) Italy. Bet on Romania vs. Georgia and claim your 100% (120 Euro) freebet at LSbet now! Romania will field a mix of youth and experience here, while Georgia will come with a young but established side, which looks strong. Romania`s lineup does look a bit better than what they fielded in November, when they played so badly against USA and Uruguay. But there are still only 7 foreign based players in the team, the rest of the squad playing in Romania`s domestic league. Their are also notable absences like V. Ursache, A. Radoi (retired), Tarus or Fonovai (injured). The Georgians also have some missing guys, but their lineup is much better. There are 14 guys in the squad from top leagues like the Top 14, Pro D2 or Pro 14, including a couple of World Classs players, something Romania lacks. There`s little doubt that Georgia is the better team here. They have steadily surpassed Romania in the last decade, and recent H2H results support that – with Romania winning just one of the last 7 meetings, and that victory came by the skin of their teeth (8-7 in 2017, when Romania was in a much better moment than now). This will be a very difficult Rugby Europe Championship for Romania. Losing some key players, having an inexperienced coaching staff and the huge disappointment of being disqualified from the RWC all put massive weight on this team. The team does not look good on paper, and the performances at the end of 2018 were horrendous. 3-4 guys from France coming into the team for this match are unlikely to make such a huge difference – and Romania would definitely need an enormous improvement compared to their performances in November if they want to challenge Georgia. If they play like they did against Uruguay and USA, they will lose this by 25+ points. At least. 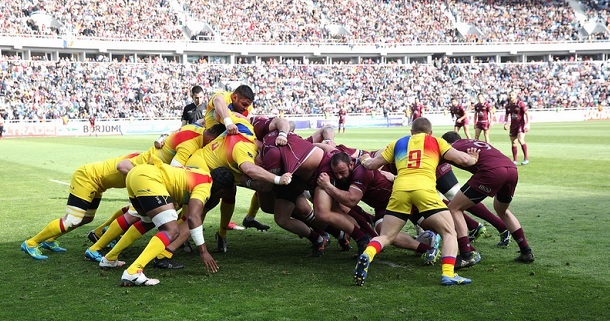 The game will be played in Cluj, which is not a rugby city, and there will probably be a couple thousand fans in a 30.000+ seater stadium – so the Romanians won`t have much support from the stands to help them out. Weather is expected to be cold, but without rain or snow, so conditions should be good – something which isn`t giving any team a particular edge over the other. Unfortunately Romania is in total disarray and looking horrible, so Georgia shouldn`t have any problems winning this. They should be able to dominate in the scrum and be more consistent out wide as well – and they could run away with it if they have a good day. My tip will be Georgia to cover the 7,5 point handicap. The line is only available at a couple of bookies now, but should become more widely available closer to game time. If not, the straight Georgia win at odds 1.35 – 1.40 is also a bet I can warmly recommend. Prediction: Romania – Georgia 9 – 24.